Join us for Winterthur Museum’s special Yuletide Tour. 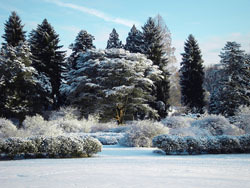 The 2010 tour highlights the winter celebrations of Henry Francis DuPont and his family at Winterthur. Henry DuPont owned several houses, but only Winterthur was “home” where family and friends gathered each year to celebrate the holidays. New this year are vignettes depicting mid-1800s Christmas celebrations and the January 1938 wedding festivities of Pauline Louise DuPont. 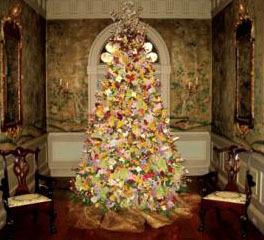 Garden-inspired trees and the perennial favorite, Winterthur’s magnificent dried flower tree will also be on display. After the tour enjoy the other Winterthur exhibits and sights. Take a tram tour around the gardens (weather permitting). Also check out the special Betsy Ross Exhibit. Betsy Ross is one of the best known figures of the American Revolutionary era—and also the least understood. Legend has cast her as a simple seamstress honored by an unexpected chance to contribute to the independence. In this exhibit you will meet the real Elizabeth Griscom Ross Ashburn Claypoole who was a celebrated flagmaker and upholsterer. You are welcome to come early and enjoy lunch with fellow alums at the Visitors center cafeteria. The tour begins at 1:00 PM but if you plan to attend just for the tour please arrive 30 minutes ahead. As the holiday season begins join us for this exciting afternoon as we tour this most elegant DuPont country mansion.